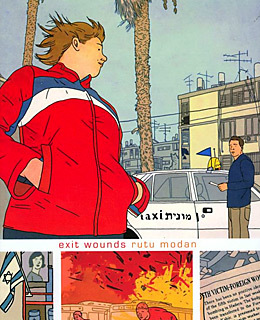 An Israeli taxi driver is approached out of the blue by a young woman, a soldier, who tells him that she has been having an affair with his estranged father, and that his father may (or may not) have been the victim of a suicide bombing. This psychically fraught setup, and the question of whether or not the older man truly is dead, drive the fleet-footed, high-spirited plot of Exit Wounds, which is laid out in eloquent, perfectly composed matte panels. The calm clarity of the artwork is at odds with the story's heavy psychological burden: everyone inside those neat squares and rectangles has been wounded in some way, either by the violence of the Middle East or the more universal hazards of family and romantic life.